Congratulations to Abigail Wilson, first-year goalkeeper for the RRC Rebels women’s futsal team, who is our female athlete of the week. Wilson made 13 saves this past weekend to help earn a 1-1 draw against a high scoring CMU Blazers team and clinch the final spot in the women’s final four this weekend. The Rebels (5-2-3) will host a rematch against the top ranked Blazers (7-1-2) at 11:00 AM this Saturday, March 9, in the women’s semifinals of the 2019 MCAC Futsal Championship. The Rebels futsal teams finished their MCAC regular season at home this past weekend with games against the CMU Blazers. The women Rebels earned a hard fought 1-1 draw against the top ranked Blazers. 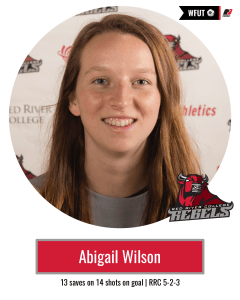 Logan Bresciani scored the goal for the Rebels while goalkeeper Abigall Wilson had an excellent game stopping 13 out of 14 shots, helping earn the Rebels a playoff spot. Unfortunately the Rebels men’s team lost their last game of the season, 5-2 to the Blazers. Bailey Novicki and Josh Wall were the goal scorers. The men’s team finished with a 2-8 record and out of the playoffs while the women’s team finished in 4th place with a 5-2-3 record. RRC will be hosting the MCAC futsal championships this weekend with our women’s team taking on CMU in the women’s semi at 11:00am Saturday March 9th.